I started to tell the story of the Ouseburn in the previous post, but have not yet reached a happy ending. The Beast that is Newcastle Airport has been transformed, if not by a kiss, then by intelligent regulation, but the river is still far from being beautiful. The Environment Agency, the Handsome Prince in this particular fairy story (has it ever been described in such terms before?) needs to ride out to find other monsters to slay. One candidate that my students usually identify in their write-ups is phosphorus, whose concentrations have gradually crept up over the years, as the graph below illustrates. As in the graphs in my previous posts, I have differentiated between data collected by the Environment Agency and my students. I have also circled a cluster of points that sit outside the main trend, as a reminder that my students are still learning their craft, and sometimes may make mistakes. The trend is, nonetheless apparent: the river has had elevated phosphorus concentrations for as long as measurements have been taken, and concentrations are gradually creeping upwards. The student’s data may exaggerate this slightly, but the trend is definitely there. Although no sewage works discharge to the stream, there are plenty of storm drains, and there are concerns that domestic “grey water”, and its associated detergent residues, may be entering these rather than the foul sewers. More recently, a study as part of the Ouseburn River Restoration Project (ORRP) has found that some farmers in the upper part of the catchment are stockpiling farmyard manure on behalf of livery stables and some of the leachate from this may be entering the upper stretches of the river. 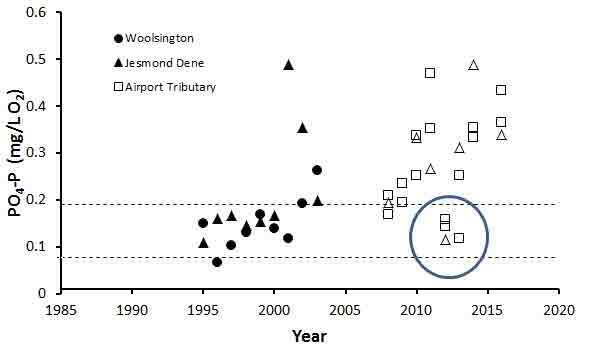 Trends in concentrations of reactive phosphorus in the Ouseburn over time. Woolsington is upstream of the airport, Airport tributary (Abbotswood Burn) receives runoff from Newcastle Airport and Jesmond Dene is about 10 km downstream from the airport. Closed symbols are annual means of data collected by the National Rivers Authority and Environment Agency; open symbols are means of data collected and analysed by Newcastle University Geography students in October (once also in February) of each year. The lower dashed line is the UK environmental standard for reactive phosphorus to support “good ecological status”; the upper dashed line is the threshold between “moderate” and “poor” status (the threshold between “poor” and “bad” status is at 1.04 mg/L). In addition to problems such as phosphorus that we can see from our analyses, there are problems that are less obvious because they only happen occasionally, and not necessarily when a sampler is dipping a bottle into the river. The Pantomime Villain of this story (“He’s behind you …” “oh no he’s not”, “oh yes he is …”) is the overloaded sewerage network and, in particular, the storm sewer overflows which divert foul waste into the river when the sewers are overloaded with surface water from heavy rain. Even though the graphs in the previous post showed that ammonia and BOD are usually at low levels, there will be short periods when the storm sewers dump raw sewage into the river. This is a great lesson to my students in why biological monitoring is so necessary: the poor quality of the invertebrate community reflects the state of the river through the whole year, not just the minute or so when the sampler’s bottle is being filled. A combination of hard impermeable surfaces, the drainage system with its overflows and many artificially-straightened lengths of the river mean that storm water makes its way very quickly to the stream (see “Fieldwork in the rain”). In extreme cases this can lead to homes and businesses being flooded. These straightened sections of the river also mean that there is little variation in velocity to create the variation in habitat that would allow a range of organisms to find suitable conditions to thrive. 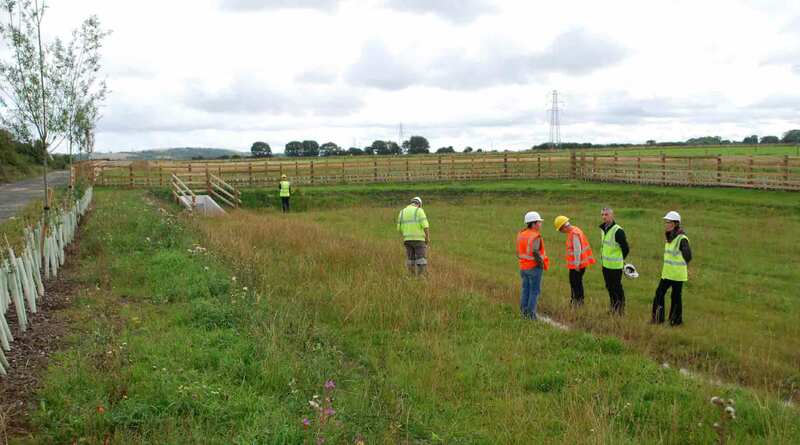 So another of the objectives of the ORRP is to restore the natural meandering path of the river in the upper stretches as a first step towards creating a more natural river which will, at the same time, slow the flow and reduce the likelihood of flooding downstream. New property developments such as Newcastle Great Park have been designed with Sustainable Drainage Systems (see “In search of SuDS …”) to create more permeable areas that will soak up rainfall and slow its journey to the river, reducing the size of the flood peaks associated with heavy rainfall. Challenges facing the Ouseburn: left: Newcastle Great Park, one of a number of new or planned housing developments in the upper part of the catchment; right: straightened river channel near Three Mile Bridge beside the Great North Road in Newcastle. To be honest, there are many grander rivers in the country than the Ouseburn where I would prefer to do my fieldwork. I feel privileged to be able to visit the River Ehen in the Lake District on a regular basis. We rightly worry about maintaining fragile ecosystems and rare species in these remote places but the Ouseburn presents equal, if less romantic, challenges. Most of us are urban, rather than rural dwellers and our most likely interactions with the aquatic world will be with these artificially-straightened extensions to our overloaded sewerage systems. There is something of Frankenstein’s monster about these rivers: at their worst, in flood, they are our own creations, the result of our own attempts to overrule nature. So I am very enthusiastic about the work of the ORRP and similar schemes around the country. These are a small step towards restoring a natural harmony between man and water, and working with, rather than against the powers of nature. And creating a greener, more pleasant urban milieu in the process. The best ideas in environmental management are often the simplest. That sometimes means that they are not particularly photogenic. I offer this as an excuse for the photograph above, in which six ecologists appear to be somewhat underwhelmed by a shallow manmade depression just on the edge of a housing estate near Jarrow. The main topic of conversation, I have to admit, was: “why do they insist on us wearing hard hats when all we are doing is standing in a shallow depression?” That’s health and safety for you. The visit came as part of a seminar on Sustainable Drainage Systems (SuDS) at Northumbria University which I attended last week in order to brush up some lecture notes ready for the new academic year. I wrote a post last year about how quickly river levels can change in urban areas (see “Fieldwork in the rain”) and the effects can sometimes be catastrophic (the infamous “Toon Monsoon” in June 2012 being a case in point). The problem stems from the lack of permeable ground in urban areas, which means that water runs straight into drains and into rivers. We could address problems of urban flooding by building bigger and more efficient drains and sewers but that comes at a huge price – both in financial costs and in the disruption caused as roads are dug up to allow access to the drains. Or we could try to mimic nature and simply slow down the journey that rainwater takes once it hits a surface. That’s the basic principle behind SuDS, achieved by providing a range of permeable surfaces, channels and collection / retention ponds, all of which can, at the same time, have aesthetic and biodiversity benefits for local communities. The photograph above doesn’t really capture the aesthetic benefits but my camera was on the wrong setting when we visited a nice reed-lined pond as part of the same development. Sorry. The works we were visiting were part of a scheme funded by Northumbrian Water to address flooding issues around the Fellgate estate in Tyne and Wear. That a major utility company is investing in SuDS shows how seriously these are being taken as options for flood control whilst, at the same time, illustrating a more profound point. There is a tendency for us to externalise problems such as flooding and to expect local authorities and water companies to find solutions on our behalf. Yet the problem is partly one of our own making. I can look out of my windows and see front and back gardens of neighbours that have been paved over, much reducing the amount of permeable surface into which rainwater can percolate. Your lawn is a part of your local SuDS, whether or not you realised it. And your gutters do not need to funnel straight into the drains either: that water could be collected and used to water the garden or wash the car. The two pictures below show the direction we could be following: the first is a “green roof” atop one of Durham’s colleges, which uses rain that would otherwise go straight into a water course to sustain vegetation that, in turn, provides insulation for the building below. 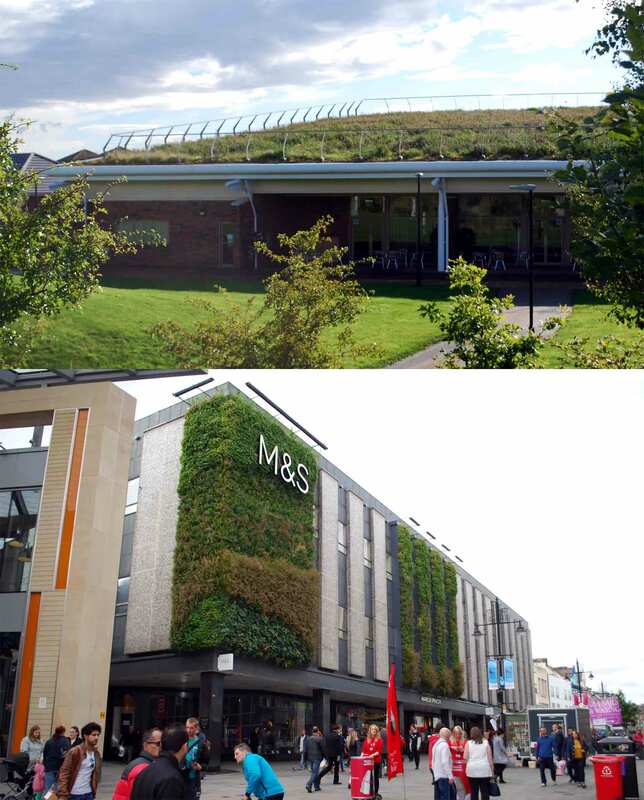 The lower image shows a “green wall” at a local branch of Marks and Spencer, fed by rainwater harvested from the roof and providing an aesthetic diversion for Newcastle shoppers, as well as playing a role in flood prevention. I also wrote about a flood channel that doubled as an urban recreation space in the centre of Seoul (see “A brief diversion to South Korea”). Top picture: the green roof of Josephine Butler College, University of Durham; bottom picture: the green wall at Marks & Spencer, Northumberland Street, Newcastle. If the photograph below looks vaguely familiar it may be because you are old enough to remember the 1970s as this scene of the Ouseburn valley in Newcastle is part of the opening sequence of Whatever Happened To The Likely Lads? Were they to revisit now, Terry would be appalled, but proto-bourgeois Bob delighted, to see the first stages of gentrification creeping through the area. Lime Street, Ouseburn valley, Newcastle, March 2015, looking upstream towards Jesmond Dene. The entrance to Seven Stories, the National Centre for Children’s Books, is just visible on the right of the picture. Follow the road off to the right and you pass the Cluny, a pub with a good range of real ale and a strong reputation as a live music venue, then past a warehouse (now converted to artist’s studios) to an old ford across the Ouseburn. I wrote about the Ouseburn back in October, when I made my annual visit with a group of undergraduates but the section I have brought you to today is close to the point where the stream joins the Tyne, and is tidal. I had seen some interesting growths of diatoms here in the past so had come back at low tide to add a brackish dimension to the story I was telling in The Ecology of Cold Days. I was looking for the chocolaty-brown film on the tops of rocks, similar to those that I described in my earlier post but these were not obvious today. Instead, I found some intriguing diatom growths on the vertical wall of the old warehouse just above the water level. I scraped up some of this film and took it home for a closer look. These samples were, as I expected, teeming with diatoms, though the assortment of diatoms that I could see was quite different to those I had seen before. I have written about estuarine diatoms in a couple of posts (see “In the shadow of the Venerable Bede”) but do not pretend to any great expertise. However, most of the genera are familiar to me from freshwaters, even if I cannot name the species. I could see Navicula and Nitzschia, both common in the river samples that I wrote about in The Ecology of Cold Days; however, the most abundant genera were a species of Surirella (also common in freshwaters) and, in particular, Entomoneis; a genus that is relatively rare in freshwater (see “The Really Rare Diatom Show“). The view down the Ouseburn; the former warehouse (now artist studios) is on the right foreground; beyond is the back of Seven Stories. 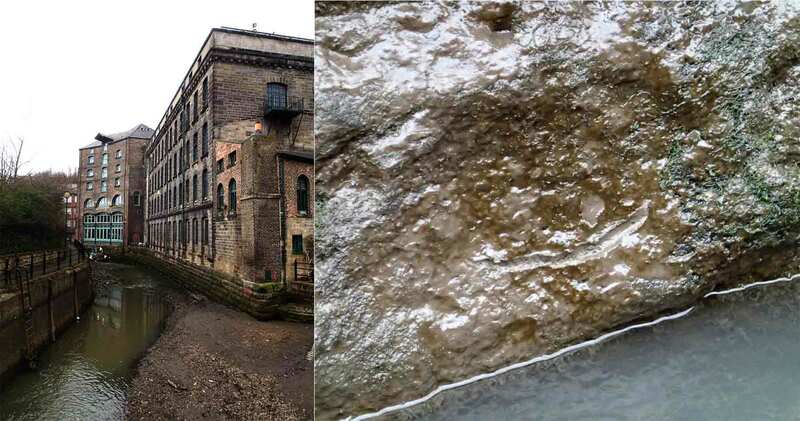 The right hand image shows the diatom film just above the waterline on the side of the warehouse. Entomoneis is a diatom whose structure is difficult to capture in a photograph as the cells are twisted around the apical axis (see Chris Carter’s photographs in The Really Rare Diatom Show). The right hand image below is an empty frustule lying in girdle view; the other four images are live cells. The constant motility of the living cells was an additional complication as I was trying to photograph them. Common features about all these biofilms that I’ve written about over the past year is that they are dominated by diatoms that are capable of movement and they seem to be especially luxuriant in the cooler times of the year. Being able to adjust their position is, obviously, an advantage in an unstable environment where there is a chance that particles will shift or new ones be deposited, robbing the cell of the light it needs for photosynthesis. Luxuriance in the winter and early spring may reflect the absence of grazers at these times of the year, but there are also hints in the literature that some algae are particularly well adapted to growing at low temperatures. It is natural selection in action: having a physiology that functions in cold water lessens the chances of the fruits of their photosynthesis being turned into another organism’s roughage. Entomoneis’ fondness for the cold extends far beyond north-east England: a recent paper recorded it as the most abundant alga growing on the underside of sea ice in the Antarctic. It is, in other words, a typical Geordie alga, swaggering through the Ouseburn’s biofilms dressed in a tee-shirt, regardless of the weather. Terry would have approved. Entomoneis sp. from the tidal section of the Ouseburn, March 2015. The right hand image is an empty frustule. Scale bar: 10 micrometres (= 100th of a millimetre). Archer, S.D., Leakey, R.J.G., Burkill, P.H., Sleigh, M.A. & Appleby, C.J. (1996). Microbial ecology of sea ice at a coastal Antarctic site: community composition, biomass and temporal change. Marine Ecology Progress Series 135: 179-195. Fortune dealt a bad hand for the annual GEO2042 fieldtrip to the Ouseburn. For the first time in six years, it rained before and during our visit to collect water and invertebrate samples. By lunchtime, the water levels had gone up so much that we were worried that the afternoon’s session may have to be abandoned, for safety reasons. 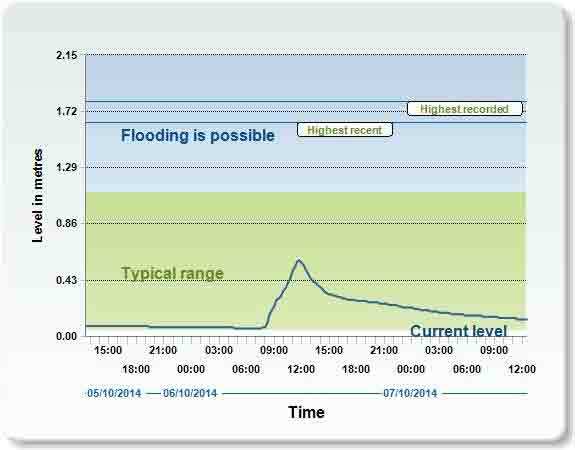 Fortunately, the rain eased at about 1300 and the river levels started to drop again. 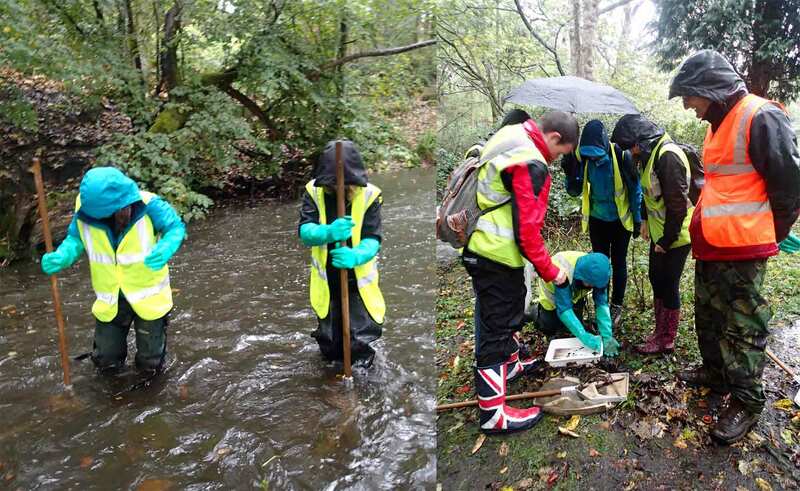 Fieldwork on the Ouseburn, Jesmond Dene, October 2014. Left: kick sampling for invertebrates in the river; right: investigating the contents of a pond net. The progress of the day’s storm are neatly demonstrated on the Environment Agency’s excellent realtime water level monitor, situated about a kilometre upstream from where we were working. The two groups of students were out between 1100 and 1200 and between 1300 to 1400 – either side of the highest level recorded at about midday. Look how quickly the water level rose from the baseline. This particular rainfall followed a long period of warm, dry weather, which has kept water levels down all over the region. 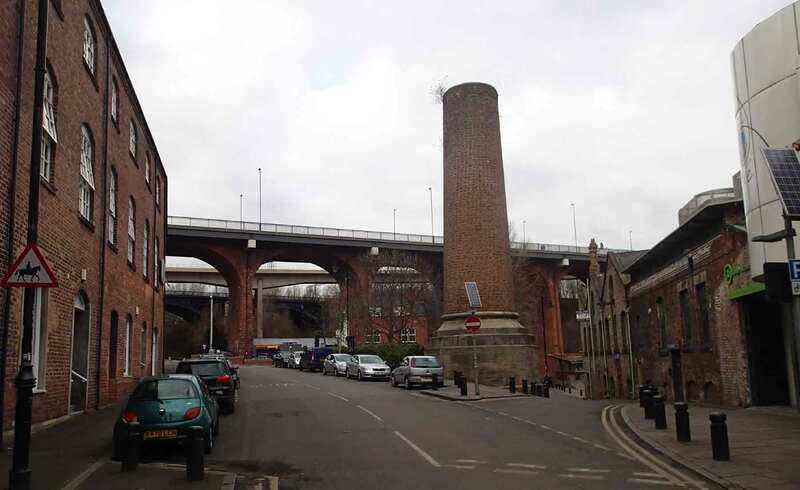 The Ouseburn flows through built up areas of Newcastle for most of its short length, which means that a lot of the water will run straight off hard surfaces, into drains and into the river. Hence the rapid rise of the river levels, followed by the gradual drop as the water that had soaked into the ground gradually found its way to the river. Compare this brief storm event to the hydrograph for the River Coquet that I showed earlier in the year (see “Fieldwork in Northumberland”). In this instance, the river level went up more gradually, reflecting the much lower proportion of hard surfaces in the upstream catchment, before gradually declining. To the trained eye, these graphs show the effect of man’s alteration of rivers just as clearly as any measurement of “pollution”. One of the legacies of less-enlightened times that we have inherited is a system of combined sewers that carry both foul waste (don’t ask) and storm runoff. One effect of prolonged rainfall is to fill these sewers with water from drains and, for this reason, there are overflows built into the system which let the excess flow straight from the sewers to the rivers. Unfortunately, this overflow includes untreated sewage as well as storm runoff and, by Monday afternoon, the river had a distinctly unsavoury odour. The long-term plan is to replace these combined sewers with separate networks of storm drains and foul sewers. That, however, will take a long time, a lot of money (an awful lot of money) and, as most sewers run under our roads, serious disruption, to implement. So we will probably have to live with these combined sewer overflows for some time to come.